This is a list of some of the sites that disseminate your personal information, and how to either get yourself removed from their databases, or at least get your name filtered out of their results. A good starting place to see how things look for you would be Pipl.com - http://pipl.com/ - Does a quick scan across a number of info sites, including social networking, discussion/comment aggregators, and photo storage sites. Click the, "Remove this listing," link and follow the instructions. Spokeo - http://www.spokeo.com/- Search for yourself on Spokeo first, and copy the URL of your directory listing. 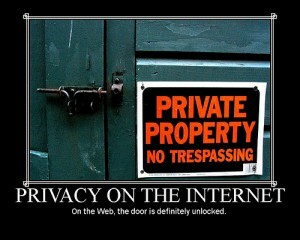 Then go to http://www.spokeo.com/privacy to fill out a form, where they ask for the URL of the listing you want removed. A few "problem children." These sites require you to jump threw a few extra hoops in order to block your information. If you only do one, do Intelius - Their information powers a lot of other sites out there. If you take the time to nip the Intelius bud, that will stop the flow of information to many other places. "In order for ZabaSearch to "opt out" your public information from being viewable on the ZabaSearch website, we need to verify your identity and require faxed proof of identity. Proof of identity can be a state issued ID card or driver's license. If you are faxing a copy of your driver's license, cross out the photo and the driver's license number. We only need to see the name, address and date of birth. We will only use this information to process your opt out request. Please fax to 425-974-6194 and allow 4 to 6 weeks to process your request. " "In order for us to suppress or opt out your personal information from appearing on our Website, we need to verify your identity. To do this, we require faxed proof of identity. Proof of identity can be a state issued ID card or driver's license. If you are faxing a copy of your driver's license, cross out the photo and the driver's license number. We only need to see the name, address and date of birth. We will only use this information to process your opt out request. Please fax to 425-974-6194 and allow 4 to 6 weeks to process your request. We will only process opt out requests received by fax and no request will be processed without complete information (i.e., name, address and date of birth). Requests for opt out will not be processed over the phone or via email." "However, please note that any time your identifying information appears in a public record or in a publicly or commercially available manner, in a way that is different from the particular record you opted out, it will again appear on our Website. For example, if your address or area code changes, your new information -- including other associated identifying information -- will again appear unless you opt out the new record. Similarly, if the way in which your name or address appears in a record differs from a record you opted out (e.g., "Michael" instead of "Mike," or "1212 Second AVE NE" instead of "1212-2nd Avenue Northeast"), we may include the differing record." Offers a "Privacy Lock" service (no fee) to block access to your public records through their site, as any affiliate sites they power. After identifying the record you wish to block, they give you a form to print out, which you need to return to them along with a copy of your Driver's License or State ID.